This afternoon while I was going about my normal day I received what may be the most devious scam attempt I have ever experienced. Take my experience and remember to be vigilant at all times, scammers are pulling out all of their best tricks to gain access to your accounts. I received a call from an unknown number [800-922-0204] but answered the phone anyway to see if it was possibly a call I actually needed to answer. I said Hello, and there was a short pause of dead air. This should have clued me in a little bit because a lot of these scam calls have a big delay before the scammer talks. I’ll do my best to lay out the transcript of the call from my recollection. This isn’t verbatim. The incoming call at 2:58pm that appears to be from the actual Verizon support number. [Scammer]: Hello Sir, I’m calling from Verizon Wireless to alert you to an order on your account that we believe wasn’t made by you. We’ve put a security restriction on your account but want to make you aware. There was an order for an iPhone X made to New York, while we have your billing address as [MY ACTUAL ADDRESS] which doesn’t match the order. We wanted to make sure you were aware of this order in case someone has taken control of your account. [Me]: No, I certainly did not make any orders for a new phone on my account. [Scammer]: Thank you, we’ll put a stop to the order and will set a security lock (I forget the word he used) on your account. First I need to verify who I’m speaking with so I will send you a pin code via text message and I need you to read that back to me. [Scammer]: Okay I have sent the pin code, please read it back to me. Temporary password redacted, but you’ll notice this is actually from Verizon so the number matches the number the scammer spoofed to call me. [Me]: No, I don’t feel comfortable with this. I’m not going to read the pin back to you. [Scammer]: Okay sir, I do encourage you to act on this as soon as possible to secure your account and thank you for being a Verizon customer. There are a few things that validated the whole thing for me. To start, the number they called from, which was being spoofed, is the actual Verizon support number. You can see in the text message (that actually came from Verizon) the number matches up. The second part is just that this is a common tactic, break into accounts and order phones/SIM cards and ship them elsewhere. Lastly, the scammer knew my actual billing address and gave it to me as evidence. However, the more I looked at the text message the more skeptical I became. 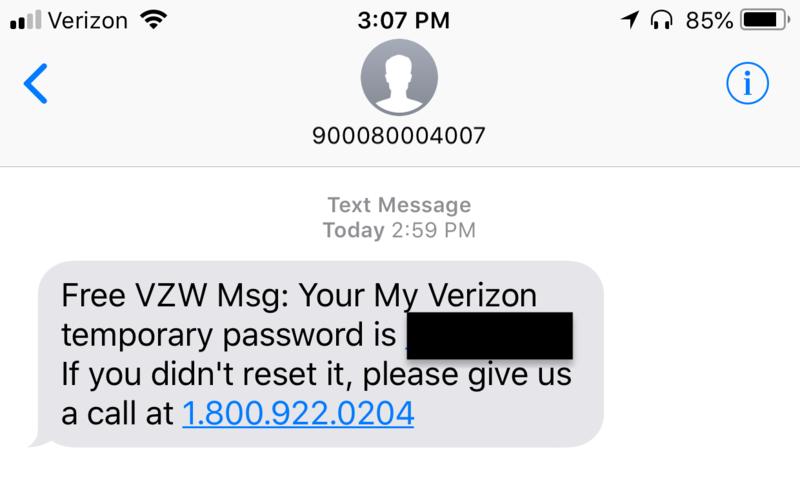 Why would Verizon need to send me a password reset code and have me read it back to them? The scammer was using the password reset tool on Verizon and once I gave him that code he could change my password to anything he wanted. Now to make sure my account was secure I went to log in, and my password obviously wasn’t working because I had a new temporary password from Verizon. I logged in with the temporary password and changed my password myself on Verizon’s website. After that was done I checked my recent orders online to find nothing there. I called the actual Verizon support [800-922-0204] to talk to a representative and first check if there were any orders on my account. She confirmed that my account was secure and there had been no orders made. I also informed her about the scam attempt and she said that they are aware and doing everything they can to combat them. What can they actually do to stop this; I surely don’t know. It’s always a wake-up call when a scam gets this close to you, they’re using all the tricks possible. This scammer even stayed ‘in character’ all the way to the end after I had denied him access. The best process to follow, and I need to remember it myself, is to hang up and call back on the actual support number. Use the companies website to go to their support center and get the official phone number, email, or chat. Even with the best computer security you can have, if you open the ‘front door’ for scammers and let them into your accounts, your computers, etc. you’re doomed. Often times you’re the first line of defense so stay sharp out there! If you’re a PC Matic customer and haven’t taken it or it has been a while since you did I highly recommend the included KnowBe4 security awareness training that comes with our product. KnowBe4 are experts at user training and this course is specifically designed to help consumers notice scam attempts before it’s too late. PC Matic customers can contact customer support to get the access details for the course. PC Safety, The Pit Blog. permalink. Still happening April 2, 2019 – called from my phone 611 to be sure i would get a real verizon rep. Did not want to give my pin and he hung up on me…he sounded Nigerian. Stay safe out there Pieter! I got the same call today and only realized midway that it was a scam. Luckily the order did not go through. This happened to me in October. I gave the PIN and they order an IPhone X. I called the fraud department and they supposedly cancelled everything but the phone was shipped out anyway. Although I was not responsible from Verizon’s perspective there was no way I was going to allow this crook to get the phone. I saw that the first attempt by UPS was sent back so I called UPS to block a second attempt. They refused unless Verizon authorized it. So I called the fraud department @ Verizon and spoke to a manager and they said they were not authorized to call UPS to block the shipment (Verizon – If your reading this, empower you managers to make the right decisions). She even suggested that I stake out the delivery address and intercept the phone myself…Just crazy. Instead what I did was change the delivery address to my house through UPS. Since I had the the package # and address it was being sent to I created an account on UPS and rerouted back to my house and then shipped back to Verizon on my own dime. It was a matter of principal. The whole experience was really eye opening. The larger a company gets the less common sense they have. I saved them $1100 bucks. ~ The nice lady also told me that in order to open an account under someone’s name they need name, address, phone number, full social and proof of id… I’d like to think of myself as being “virtually safe” but there’s is no end to the scams these hackers will pull, stay safe everyone ! That’s an interesting twist on the scam! Thanks for sharing the details of it with us Rebecca. Stay safe! This happened to me today, I received a call from Verizon say there was an issue with my account, sent me a new pin number and asked me to read it back to them. Unfortunately I did, but after the conversation I called Verizon Customer Service and told them what transpired. They blocked the changes to my account and I reset my Passwords. Also they tried to order a new I-phone. That was good thinking to call Verizon afterwards though John, you saved yourself from some hassle there if it had gone on any longer. Stay safe! Im a member of Verizons Fraud Prevention Team. This call is very close to a call we place to customers when theres an order on your account that is automatically flagged by our systems. Usually its a discrepancy with the billing and shipping addresses. While speaking to you the caller most likely had Verizon on the other line or another phone pretending to be you. They would of communicated the pin back to the agent in order to gain access to your account. We do have several methods of combatting this issue. If it was an actual Verizon agent, they would of encouraged you to call Verizon back and would of noted your account to reflect the interaction. We also would have disabled your MyVZW account immediately to prevent any other further information becoming compromised or social engineering attempts. Its important all customers confirm anyone who calls them and we encourage you to. Calling Verizon directly is the only way to do that. However we do make these calls to customers every day. When we do we take measures to make sure we are speaking to the intended customer. The best thing to do is ask the person you are speaking to add a note to your account and call Verizon atound 10 mins. later. Just FYI, any agent can reset your pin at that point and you dont need to speak to Fraud unless you desire to. Fraud cases can be extensive, so please be patient if the wait time feels a little longer than a normal call for customer service. If anyone would like to ask questions, I’ll do my best to help. I do understand it can be confusing and by nature we are putting customers in a situation where they feel vulnerable. The more people understand how to protect their accounts, the easier my job is. However, there are limitations to things I can say here as potential fraudster can use our methodology to improve their tactics. This is a different take on the phishing calls. 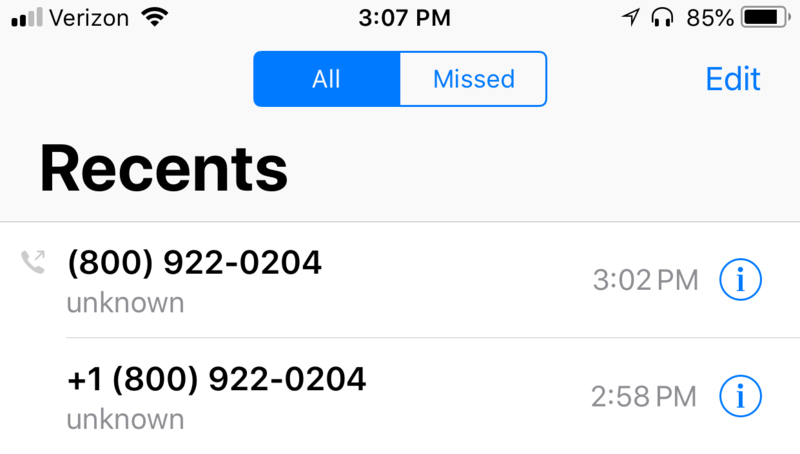 I received a call from a restricted number, and it had a recorded voice, with sound effects, saying it was Verizon, and that my account was blocked, and to enter whatever number it was in order to reach a customer service representative. The sound effects sounded like when I call my bank or credit card company, and it’s processing or retrieving an account. Anyway, I don’t believe that any cellphone provider calls for a blocked account, or none payment. If you’re account is blocked, or you failed to pay the bill, you’ll find out on your own. Anyway, I just hung up and called Verizon directly. The Verizon customer service representative told me that they don’t call using a restricted number. Anyway, they checked my account and all was well. The customer service representative told me that a report about this will be made. I had this happen today. The caller said he was from Verizon fraud. I called Verizon fraud and of course found out Verizon hadn’t contacted me. I had my online account closed. Even hours later I got a message from a different “Verizon” number, which was still a scam. I gave the pin unfortunately but she said she needed a bunch of other info that I refused to give. Hopefully nothing happens. I gave no personal info. Hi Megan, I would call Verizon directly and make sure that your account is secure to be safe. If they had the PIN they may have been able to reset your password. My husband fell for this scam today. He didn’t doubt the call at all and thought he was actually helping secure his account and gave them the code. What happened a few hours later is that all our numbers were blocked and we couldn’t receive or make any calls, because they had logged into the account and put another person as an account manager, forwarded our numbers to other numbers and bought a new iphone under one of the numbers on the account. 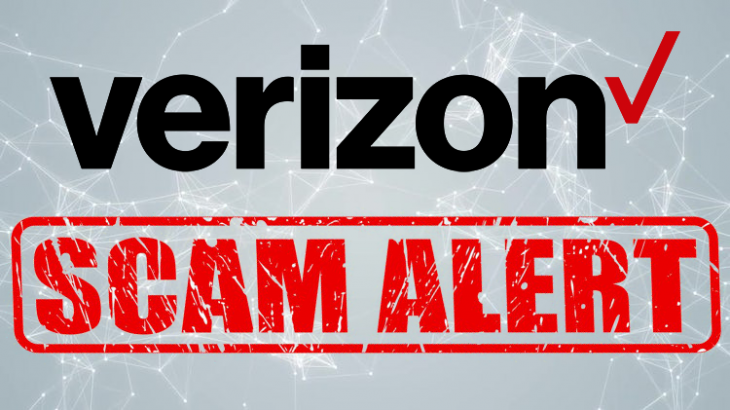 When we managed to call the actual Verizon, they were able to remove the fraudster from the account, reverted our numbers back so we could use them and cancelled the transaction for the i-phone and refunded the money. So I hope there will be no more lasting consequences for us but it was definitely stressful to realize somebody has got control over your account and phone numbers and can use them for whatever they want. Now we still can’t use the online account because it’s temporarily blocked and under investigation. But good thing is the scammers can’t use it either! I’m just wondering if they actually got the i-phone or not… and if there’s a way to catch them, but I highly doubt it. Almost fell for it. I started asking questions and got hung up on. I immediately logged on and changed my password. Glad someone called it in because I didn’t want to sit on hold forever. These crooks are getting smarter all the time. Stay vigilant!!!! thank you for putting this article up. Just had the same exact scam try it on my mom. The guy called himself Joseph and said he for the verification department and said we could call back. When we called Verizon they had no record of anything like a phone bought in the Bronx. Don’t give them the code. Happened to us just a few minutes ago actually! dang! I think this just happened to me but a little different. Everything looked legit but felt wrong. I did give the pin to my account, they said they needed to update my phone because it was not sending ‘full” texts. This was the first red flag because i was texting profusely with my girlfriend, just prior to the call, with no problems. They asked me to read back a couple confirmation numbers while they updated my phone. I called verizon back and they noticed my billing address immediately changed. I went through and updated all passwords and codes but im still worried something got through. So far nothing else has been done to my account or phone other than that address change. This actually happened to me yesterday, the scammer said all the right things and speed up the pace of the conversation. A great tactic to keep you the victim off balanced and not thinking correctly. They actually got me pretty far into their process before I had finally realized this was a scam. So I ended the call and immediately called the Verizon. Apparently, they had added a person to my account, which Verizon was able to remove. I let all my friends and family know about this as well as changed my password for an added precaution. The biggest tell tale sign is them asking you to repeat a pin they sent you. Be Smart and question everything. I have USAA banking and they will use sending a code to my cell as a verification tool. I told my wife to go ahead with the call because this is something that I am used to with USAA having had my bank account broken in to. Luckily Verizon called my brother-in-law at the same time as the scammers and were able to divert us. Very tricky scam. Something needs to be done system wide in the US to stop these types of calls. We get them to each of us in the family at least three times a day. I don’t know if it’s because we used to live in El Paso in a border town, or if it is a broader issue. So is there anything more devious going on with this one than to purchase a device with someone else’s account and use their data? I changed my password but I’m still concerned about what they had access to and whether I should be prepared for any other problems. Changing your password is definitely the best step you can take. They’re looking to gain control of your account and start to cause damage from there. It could be to purchase phones, it could be to leverage it into access to other accounts. It’s hard to say. However, you changing the password will lock them out of the account and shut down that access. If you’re still concerned, call the real Verizon support and just check in to make sure your account activity looks normal and all is well. Is there anything more devious involved in this scam other than trying to purchase a device using your account? I’m a bit nervous about this. Password and other details are changed but I’m still concerned. Thoughts? Thanks for any insights! why not just ignore any (and all) 800 number calls that do not reveal any name or ID. let the call go to voice mail and determine what to do after thinking about the genuineness of the message, instead of trying to sort it out in real time, as the scammer obviously intended? That’s definitely a possible approach, scammers will most likely not leave a VM so you can then just disregard the call. While I think I am above average with these scams I may have fallen for this one! This tip alone is worth the price of the protection that you guys offer! Bravo…. Clap Clap Clap! So please tell your friends, loved ones, enemies and everyone to be careful and not fall for this scam. Point out some of the things that are common in phishing, and if you — or your friends and relatives — are concerned that an account has been compromised, go directly to the website and never click on a link in an email.